1 of 5 Coat slow cooker bowl with nonstick cooking spray. 2 of 5 Season brisket with paprika, salt and pepper. Place in slow cooker. Scatter onion and garlic over brisket. Combine tomatoes, broth, vinegar and sugar. Pour over brisket. 3 of 5 Cover and cook on High for 6 hours or LOW for 9 hours. 4 of 5 Remove meat from slow cooker and cool slightly. Slice or shred and stir into sauce. 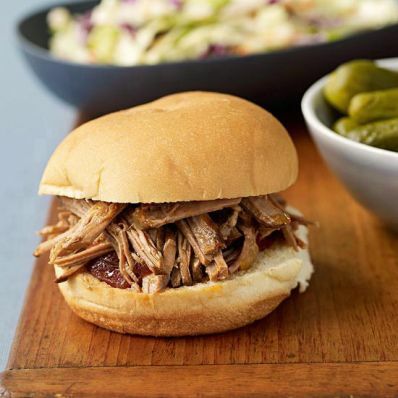 5 of 5 Remove brisket with a slotted spoon and serve on rolls, with pickles and coleslaw, if desired.